Poinsettias have been given nicknames like the lobster flower and flame flower because of their brilliant color, the most popular being a vibrant shade of red. However, those showy blooms are not even flowers. They're actually modified leaves known as bracts. 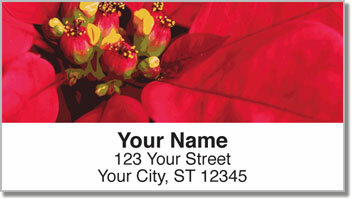 This plant may remind you of the holiday season, and these return address labels are a great choice for the Christmas season. They also make a gorgeous finishing touch for your letters and packages all year long. After all, the poinsettia is an all-seasons plant grown in all 50 states. 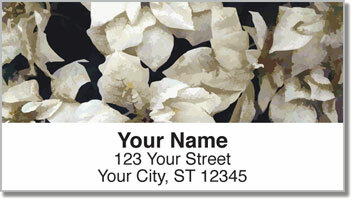 You're going to appreciate how easy it is to prepare your outgoing mail using these self-adhesive labels. Just peel and place on every envelope! 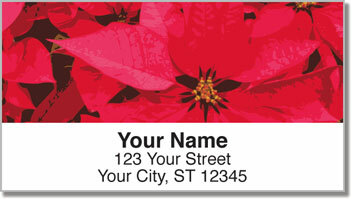 Get your own Poinsettia Address Labels today! 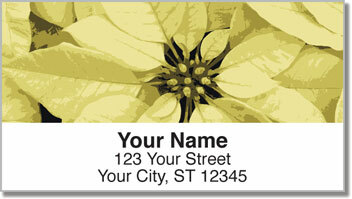 Matching personal checks are also available.